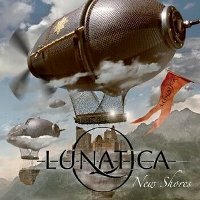 The Swiss symphonic metal band Lunatica came to life in 1998 and in 2001 they released<?xml:namespace prefix = o ns = "urn:schemas-microsoft-com:office:office" /> their debut album ‘Atlantis’, which I’m not familiar with. The catchy ‘Fables & Dreams’ followed in 2004 and in 2006 they released another catchy album entitled ‘The Edge of Infinity’. Right now I’m holding their brand new release ‘<?xml:namespace prefix = st1 ns = "urn:schemas-microsoft-com:office:smarttags" />New Shores’ in my hands... an album that I sadly have mixed feelings about. Mostly because of the annoying voice-overs that are all over most of the songs, but certainly also because of the songs. Sound and style-wise they continue where they left us with ‘The Edge of Infinity’, namely with very melodic symphonic hard rock/metal. The album opens with 4 catchy tunes packed with memorable riffs and enjoyable sing-along choruses that will stay in your head for days... but the next 4 tracks are not above average in my humble opinion. “Into the Dissonance” is a splendid example of a song that you feel you’ve heard a million times before. Track 6, “The Day the Falcon Dies” is actually alright but still lacks something. I miss a hammer chorus and riffs you wish you’ve written yourself. And that’s the problem with this album. It’s all well written, well arranged and well produced but 6 catchy tunes out of 11 are simply not enough for me. All in all... a solid album... but not quite as good as ‘Fables & Dreams’ and ‘The Edge of Infinity’ in my humble opinion.